Y'all may remember when I posted about Pillsbury taking entries for their Bakeoff. Well, the entries are in and it's time to vote! You can go to www.bakeoff.com and vote for your favorite recipes. They will post new recipes every two weeks until September 17, so be sure to go back and vote again. 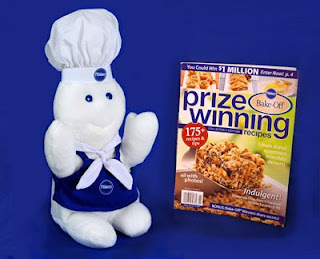 Pillsbury and My Blog Spark are going to give 2 of my readers a Pillsbury Bakeoff prize consisting of a Pillsbury Doughboy and a past magazine of Bakeoff recipes. 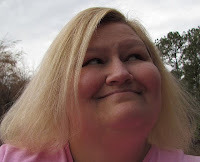 I have already found a lot of recipes I am wanting to try out of this magazine and my little one is loving making the Pillsbury Doughboy giggle. If you would like to enter all you have to do is fill out this form. Giveaway ends Saturday night at midnight-June 13. I love the Pillsbury Dough Boy! Love the picture of your little one and the Doughboy! That is so cute!